Cadence, which is a cyclist’s pedal rate measured in revolutions per minute (rpm), is one of the two components of power generation on a bicycle, with the other being gear size. The higher your cadence, in a specific gear combination, the greater your power output (i.e., more watts generated on the bike). While you can increase gear size to boost power, there are several advantages of pedaling at a higher cadence for both road and off-road cyclists. First, it reduces the stress placed on the leg muscles and allows you to ride for a longer period before you “crack.” Second, it allows you to save your legs for near-term events. For example, if you are participating in a three-day stage race, pedaling at a higher cadence can keep your legs fresher for the duration. Third, pedaling at a higher cadence places greater stress on your cardiovascular system (as opposed to your leg muscles), which enhances fitness. Finally, you can develop the ability to pedal a relatively high cadence more quickly than you can improve your ability to push big gears. There are three high-cadence cycling workouts you can effectively use during the base-building or endurance phase of a periodized training program. These include high-cadence recovery, high-cadence spinning and cadence intervals. As with a standard recovery workout, high cadence recovery will help you recuperate from hard workouts and provide you with active rest. In addition, it will enhance your ability to pedal at higher cadences. Warm-up: None, the entire ride is done at an easy pace except for the high cadence spin-ups. Terrain: As flat as possible. Gearing: An easy gear that can be pedaled at 90-95 rpm in Zone 1. Training Zone: 1 – 65-75% of Lactate Threshold Heart Rate (LTHR) or <55% of Functional Threshold Power (FTP). RPM: 90-95 with 105-120 rpm for the high cadence spin-ups. Cool Down: None. The effort should not be hard enough to require a cool-down. Begin with a cadence of 85 rpm and work up to a steady pace at 90-95 rpm. Every five minutes, do a 105 to 120 rpm high-cadence spin-up for 30 to 45 seconds (ride for at least 10 minutes before you start the spin-ups). Use very low (easy) gearing so your heart rate does not go above Zone 2. This is not a high-intensity workout. Your goal is to improve your ability to spin a higher cadence and to recover. Terrain: Relatively flat with a few rolling hills. Gearing: Use a gear that allows you to train in Zone 2 at a cadence of 90 to 95 rpm. Training Zone: 2 – 75-85% of LTHR or 56-75% of FTP. RPM: 90 to 95 with 110 to 125 rpm for the high cadence spin-ups. Begin with a cadence of 85 rpm and work up to a steady pace of 90 to 95 rpm. Every five minutes do a 110 to 125 rpm high cadence spin-up for 45 to 60 seconds (ride for at least 15 minutes before you start the spin-ups). Use small gears so your heart rate does not go above the middle of Zone 3 (90% of LTHR or 85% of FTP). Remember, this is not a high-intensity workout. Your goal is to improve your ability to spin a higher cadence and to enhance your aerobic endurance. Start with one hour and work up to two hours of high cadence spinning. Terrain: Relatively flat, low traffic road. 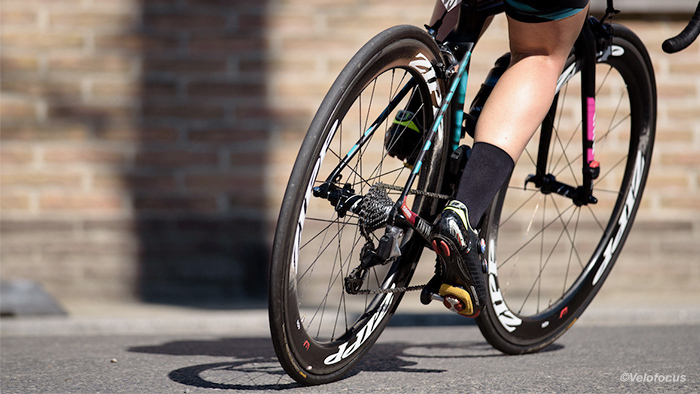 Gearing: A gear that allows you to maintain a cadence of 100-110 rpm during the intervals. The Workout: 3 x 10 min with 5 min recovery between hard efforts. You will be turning over a relatively small gear during your intervals. Your goal is to keep your cadence between 100 and 110 rpm (or 10 to 15 rpm above your normal cadence). Remember, you should not go above zone 3 during the hard efforts. If you find yourself drifting into zone 4, shift into a smaller gear. Spin about 90 rpm in a very easy gear during recovery. Build up to 3 x 15 minutes with a five-minute recovery between hard efforts. In conclusion, while high-cadence training does offer some significant benefits, there are two potential shortcomings to be mindful of. First, it increases the stress placed on the cardiovascular system. Second, frequent high-cadence training can retard the development of your musculoskeletal system. Therefore, it’s important to limit your high-cadence training to one or two workouts a week. This will provide good training for your cardiovascular system without overdoing it. It will also allow you time to perform some workouts where your gear size is relatively high and your cadence is relatively low (e.g., 80 to 85 rpm). This helps improve your muscular endurance, which is the ability to pedal a relatively big gear at a moderate cadence for an extended period.